“Functions can be really DECEPTIVE!!”. Yes, it is true.Many a time aspirants do get stuck . How to start,? How to perceive? These are the FAQ when it comes to Functions and its application. Given the CAT trend, the questions are of standard type with a slight innovation. But the root approach remains the same. In this article, some of the common structure of questions are discussed.!! (a) Plant growth depends on sunlight and rainfall. (b) Speed depends on distance traveled and time taken. It can be termed as an ” INPUT – OUTPUT OPERATOR” . In this post, we will discuss the various application of functions related questions that are of CAT LEVEL. this can be one of your scoring areas as we will be discussing some standard structured questions. So without wasting much time, let us begin our venture ! QUESTION: There were two cat aspirants Ajay and Vijay.Ajay keeps boasting about his quant percentiles( in 90’s).One day Vijay brought a question to Ajay, it said” There is a function f(x) = ax^2 +bx +c and f(4)= 100 . If the coefficients of a,b and c are distinct positive integers, then find the maximum value ( a+b+c) can attain ? “. Can you answer it faster than Ajay? F(x) = ax^2 +bx + c , what is the functional variable in this? x right !! so if it is given that f(4)=100 means that by putting x=4, the function will return a value of 100. That is f(4)= 16a + 4b + c=100 , we are good till now right! The above result is certainly wrong and could fetch you a penalty of 1/3rd marks. The term “DISTINCT POSITIVE INTEGERS ” is vital. Hope the explanation is elaborative. Let’s move to our next segment. There is a thumb rule for determining whether the given two functions are identical or not. Observe the following examples to get a clear scenario of the things. In G(x) for every real value of x, there is a value of g(x) , which also means x belongs to R.
The ln values cannot be negative or zero . So we will analyse botgh cases. In both cases there are different domains ,so the fucntions are “NOT IDENTICAL”. Questions from functions are always ghastly and require an extra effort over other topics especially in case of students without a mathematical background. Questions related to greatest integer function have been seen very frequent in past few years in various exams and mocks. So let us put an effort to unlock the mystery of Greatest Integer Function. Greatest Integer Function, [x] indicated the integral part of x which is nearest and smallest integer to x. It is also known as floor of x. QUESTION: Find the value of [3/4] + [3/4 + 1/100] + [3/4+ 2/100] +……..+ [3/4 + 99/100]. First of all the number of terms in the series is 100.
and from the 26th term each term will be equal to 1. First 25 terms are 0 and the next 75 terms are 1. How can you use the remainder theorem to evaluate polynomials? If you divide a polynomial f(x) by (x – h), then the remainder is f(h). The theorem states that our remainder equals f(h). Therefore, we do not need to use long division, but just need to evaluate the polynomial when x = h to find the remainder. A basic example to justify the above statement ! p(−x) = −p(x). When p(x) is divided by x − 3 the remainder is 6. Find the remainder when p(x) is divided by x^2 − 9. SOLUTION: Now first inference that can be drawn is p(-x)=-p(x) which implies that it is an odd function. QUESTION: If f(x) = x^4 + x^3 + x^2 + x + 1, where x is a positive integer greater than 1. What will be the remainder if f(x^5) is divided by f(x) ? f (x^5) = f(32) = 2^20 + 2^15 + 2^10 + 2^5+1. NOTE: You can try the same with x=3 and cross verify.But if assume x=1 , we will be lost. SOLUTION: Firstly, basics on Quadratic eqn , It has only two roots. in the given f(x) it will result a 0. Hope the explanation is !! If we take sets and analyze the number of functions or relations that can be obtained, we do stump on some standard results. Set A has m elements. Set B has n elements. If m>n Number of Onto functions= summation ( r = 1 to n) (-1)^(n-r) *C(n,r)*r^m;. No. of Functions from A to B – Distributing 5 distinct Balls in 3 Distinct boxes. No. of Onto functions from A to B – Distributing 5 distinct Balls in 3 Distinct boxes such that none of the boxes is empty. No. of Into functions from A to B – Distributing 5 distinct Balls in 3 Distinct boxes such that at least one of the box is empty. No. of One to One functions from A to B – Distributing 3 distinct Balls in 5 Distinct boxes such that none of the boxes has more than 1 ball. No. of Many to One functions from A to B – Distributing 3 distinct Balls in 5 Distinct boxes such that at least one of the boxes has more than 1 ball. QUESTION: If f(x − 1) + f(x + 1) = f(x) and f(2) = 6, f(0) = 1, then what is the value of f(50) ? SOLUTION: Since we know both f(0)=1 and f(2)=6, we can find f(1). After every 6 integral values of x, f(x) repeats itself. Then find the value of f(1/100)+f(2/100)+ …+ f(99/100). ( 1/100 +99/100 ) = 1 and 99/100 = (1 -1/100) so f(x) and f(1-x) has a certain relation. = 2 / 2 + 4^x. f(1 / 100) + f(1 – 1/100) = f(1) + f(99/100) = 1.
f (2/100) + f( 1 – 2/100) = f(2) + f(98/100) = 1. Similarly f(49/100) + f(50/100) = 1. We will be wrapping this article. In next part, we will be covering more on functions ( primarily – Modulus, trigonometric, graphs, etc).Till then keep practicing the structures. The above examples are just a few types based Functions (applications)there could be numerous others complex and difficult questions that could come in the CAT exam. With time and practice, you will get through. In case of any query feel free to interact. HAPPY CATing !! 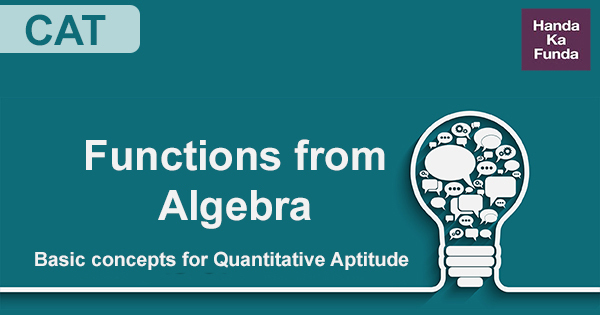 Quantitative Aptitude – Algebra – Logarithms – Question: If x is a real number such that log(base 3)5 = log(base 5)(2 + x), then which of the following is true?